Today the Paris Agreement on climate change comes into force, defying doubters the world over. Many said a decarbonisation treaty could never be negotiated. In December last year it was, and every independent nation on the planet adopted it. Many thought it would not be signed in critical mass. In April it was, by 175 nations, more than any other treaty in history. Many then doubted it would be ratified by enough nations to come into force. It was: amazingly, less than a year after its adoption. The post-Paris climate negotiations should not be viewed as a stand alone process. They take place in a world where three pertinent megatrend meta-narratives all pump wind into the sails of climate diplomacy. No one on its own would be enough to force the global energy transition underway now: it is the power of all three, acting in parallel and synergy across the full breadth of the climate-energy-information nexus, that drives the system change. First, society is awakening in critical mass to the twin threats of climate change and air pollution, and responding. Second, an energy insurgency is disrupting traditional energy markets fast. Third, the energy incumbency is facing an array of serious problems not always related to the other two megatrends. I summarise the emerging course of these megatrends each month on my website. In among all the positive developments are inevitable setbacks, but the net outcome is that the three megatrends have whipped up a fair wind in every month of 2016. My summary for October and early November follows. The UN landed two more multilateral agreements that build on Paris. An aviation pact on global warming won support from both airlines and 200 governments, and a global deal to limit use of hydrofluorocarbons also crossed the finish line. Climate diplomats go to their annual climate summit, taking place in Marrakech over the next two weeks, on a roll. Further momentum can be expected, even in the horrific eventuality of a Trump victory in the US Presidential election. Recall that America under George Bush Jr quit the 1997 Kyoto Protocol treaty on climate, but the rest of the world still brought it into force. The courts continue to play a major role in the climate story. In the UK, the High Court ruled that the government’s flimsy plans to tackle air pollution are illegal. Cutting air pollution cuts greenhouse gases by default, and strong new control measures can now be expected. In America, the New York Supreme Court ordered ExxonMobil to produce climate documents they had been withholding from the states Attorneys General who are probing them suspecting securities fraud over climate change. Meanwhile, the stranded assets story continues to gain traction. Among the developments this month, the recently retired deputy head of the Bank of England, Paul Fisher, suggested that a sudden repricing of fossil-fuel assets poses a systemic risk to capital markets. The financial world is awaiting the first report of the Financial Stability Board’s Taskforce on Climate-related Financial Disclosures, due in December, with avid interest. Renewables overtook coal as the world’s largest source of power capacity. Half a million solar panels are being installed every day now, the IEA enthused. 153 GW of renewables capacity was added in 2015, making a total of 23% of global electricity (coal is at 39%). A wonderful simulation launched on 3rd November showed how far the rise of renewables can go in principle. A Finnish team modelled a global 100% renewable electricity system for the first time country by country, hour by hour for a whole year. They conclude such a system change is achievable by 2030, and the emissions cuts entailed would keep governments on track for holding global warming below 2˚C, the Paris goal. The catalogue of renewable “firsts” continued to grow. In cloudy Britain, solar exceeded coal over the last 6 months. A Solar Trade Association study emphasised the low cost of high solar in the grid. “The cost of solar variability is negligible now, and remains low with high penetration”, the industry body concluded. Despite opportunities such as this, the REN 21 Renewables 2016 Global Status Report concluded that renewables should be progressing faster. Meanwhile, energy intensity improvements are speeding up, according to the IEA Energy Efficiency Market Report 2016. But these too need to go faster. Electric cars are set to pass the 2m landmark globally by the end of 2016. At the Paris motor show carmakers queued to show off their latest EV models. Tesla continued its pioneering effort to capture EVs, solar and batteries in one company, unveiling its new line of camouflaged solar rooftiles, plus the second iteration of its Powerwall for residential properties. This saga is not just about Tesla, or Silicon Valley, though. Daimler, for example, announced this month that it would be building a €500m battery factory in Germany. Bloomberg and McKinsey combined resources in a report concluding that lead cities availing themselves of renewables, EVs and batteries in digital networks could increase GDP almost 4% by 2030. As though to emphasise the point, the UK’s National Grid achieved another first: successfully transmitting data via the national electricity grid. Statoil’s CEO Elder Saetre gloomily concluded that the rise of electric cars will shrink the oil industry as soon as the 2020s. Shell seemed to agree. Simon Henry, their CFO, let it be known that he now thinks oil demand may peak in as little as 5 years. “We’ve long been of the opinion that demand will peak before supply”, he said. “And that peak may be somewhere between 5 and 15 years hence, and it will be driven by efficiency and substitution, more than offsetting the new demand for transport.” This view of the future is radically different to those on offer from ExxonMobil and BP, whose scenarios project oil demand growing steadily as far out as 2040. But who would finance the drilling needed to supply that? All the oil majors have been slashing capex in the face of the protracted low oil price. And it doesn’t look as though the price will go up any time soon. “Zombie companies” are “killing the oil rally”, Bloomberg reported. Around 70 bankrupt companies are allowed under Chapter 11 protection to keep churning out oil: more than a million barrels a day of it, enough to keep prices low. And as the low price era rolls on, reserves have to be written down. Exxon Mobil warns it may be facing the biggest reserves revision in its history: 19% This on top of its eighth decline in quarterly profit in a row. And even if the days of big capex budgets return, would the companies find much oil? Big spending on exploration since 2010 has lead only to plunging oil and gas discoveries, the Wall Street Journal reported this month. And here too the law is at work. Norway faces a climate lawsuit over its Arctic oil exploration plans. A constitutional amendment passed in 2014 reads: “every person has a right to an environment that is conducive to health and to a natural environment …Natural resources should be managed on the basis of comprehensive long-term considerations whereby this right will be safeguarded for future generations as well.” Good luck to anyone trying to make the case that exploring for new oil in the Arctic, in the era of the Paris Agreement, is consistent with that! On the European shale scene, Polish firms have conceded defeat and given up exploring. 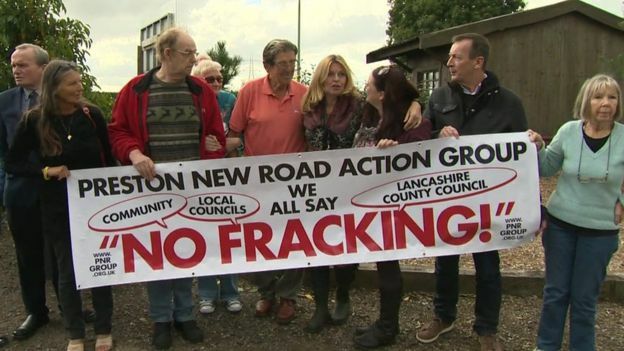 In the UK, Cuadrilla has been given the go ahead for trial fracking in Lancashire by the government, who have over-ridden local concerns. Yet more of the British public are against fracking than in favour. The latest UK poll suggests only 17% support fracking (while 79% support renewables). The Tory government professes to rule “for the people”. Their claims do not stand up to much scrutiny when it comes to energy. Then there is the problem of attracting capable workers to the oil industry in enough numbers to run it efficiently and safely going forward. 14% of millennials would not want to work in the industry because of its negative image, a recent poll showed. BP CEO Bob Dudley is among those who know there is a huge problem here. He admitted this month that in what the industry calls “the Great Crew Change”, companies risk losing out in the battle for talented staff.